As part of a multi-watch consolidation I'm selling this newly acquired Habring2 X Massena Lab ERWIN LAB01. For those of you who aren't familiar, this is a watch that was a collaboration between Habring2 and William Massena. It features a 38.5mm polished bronze case with a beautifully decorated manual winding movement with a dead beat seconds complication and a stunning black sector dial. This watch is in like new condition as I've only worn it once. More information can be found at Massena Lab. 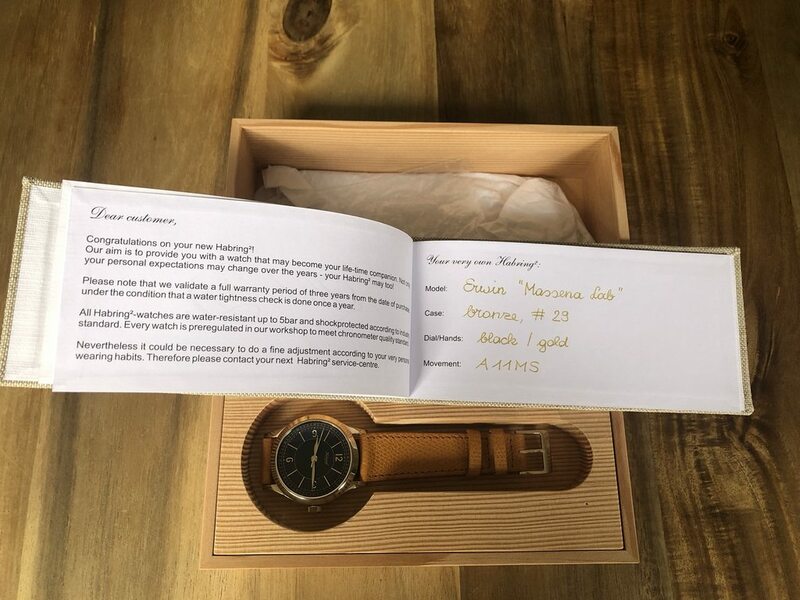 I'm selling the full set which includes the watch, original unworn strap, pine box, papers and extra parts that came with the watch. I'm asking what I paid for the watch, $5995, shipped fully insured in the continental US. I would prefer a sale in the continental US though I will consider international buyers on a case-by-case basis. I will accept payment from PayPal (+3%) , Venmo, Zelle or bank wire transfer. I tend to buy more than I sell though I have certainly sold watches over the years. I have 100% feedback as "lytton_springs" on Ebay. I'd be happy to provide credentials and or establish ownership of the watch. No returns unless I have grossly misrepresented the watch. I'd be happy to show the watch in person in San Francisco, CA. Thanks TZ for the space and without further adieu, here are some pictures.